Balto woke up and looked around Alue hd come on the boat and was asleep and he did not see nobu so He figured saba was with him so he rolled over and fell asleep again. Aleu opened her eyes.It was morning.She standed up an walked down from the boat.She wanted a litle walk. Balto woke up and saw ALue was on a walk He stretched ad went to see what the new day would bring. Aleu was sitting on the beach and watched the sun.She heard the steps on her dad. "Don't try it dad. "She said. Aleo looked back.She suppried, because Balto was walking toward the city.She run after her dad and jumped in front of him and nuzzled Balto. "Hey dad,Im sorry, I thinked you're trying to jump on me. "She blushed. "Thats okay dad, Im an adult, I think I have no time for play. "Aleu smiled. Balto said alright I was just offering but Lets go see your brothers and sister. Oh I see kodi said Still wondering what was really going on but He said Well Im sorry to here that we should go find dad. Nobu remembered he had to sleep on Balto's boat,everyone would ask him were he had been,and he knew that telling he spent the night with Saba was not an intelligent answer.He smiled at her. "thanks Saba,I had a great time with you,but right now I must go,see you later!" He turned around and run out of there very fast,accidentally crashing with Dingo and falling. "I-I'm sorry...I was..uhmm..." He didn't know what excuse to tell him,he was really nervous. Balto saw Kodi Hey Kodi Balto said H ran to his son and gave him a nuzzel. Hesaw the groupof dogs Nobu saba and Dingo and He said good morning to everyone. 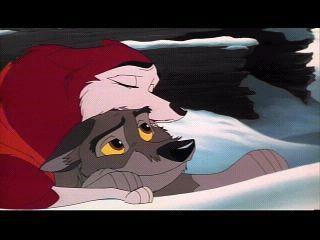 Balto new that Nobu had slept with saba and it did not bother him at all. Have a good night Nobu balto said smiling at the wolf. Kodi meanwhile said Good morning dad How are you? He saw Alue good morning alue did you sleep well? "Good moring for you two. "Aleu smiled than turned to Kodi. "Yes Kodi, Im slept well. "She sit next to him. "Listen Kodi, wat do you think about this? "She whispered him. Kodi sked about whathe whispered you mean saba and Nobu? I like Nobu and if saba likes him then he is alright with me he tol alue quietly. "And what do I say? "Aleu giggled. "I haven't seen mom since 1 year. "She smiled. "Well, than lest go check her. "Aleu smiled.